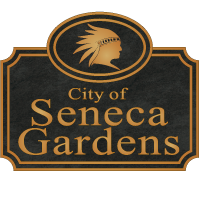 Welcome to The City of Seneca Gardens! The City of Seneca Gardens, Kentucky is a sixth class city in Jefferson County, situated between Woodbourne Avenue, Carolina Avenue, Taylorsville Road, Bowman Field and Seneca Park. Its park-like atmosphere, strong sense of neighborhood and central location have made it popular with homeowners since its initial development in 1922. We take pride in our beautiful City and are thrilled for you to be a part of it! We ask that you take a moment to review information about our City. The Mayor and City Commissioners meet on the Third Monday of each month at 6:30PM. The Meetings are held at Kenneseth Israel Synogogue in the Meeting Room Area. Residents are invited to attend. As a courtesy, please notify the Mayor of your plan to attend so that we may add to the agenda. Rumpke collects garbage and yard waste weekly and Recycling bi-weekly. Both occur on Mondays. Please put cans out AFTER 6PM on Sunday evening and collect Monday evening at the latest. Yard Waste and Recycling must be taken to the curb. Please keep all waste out of view from the street.